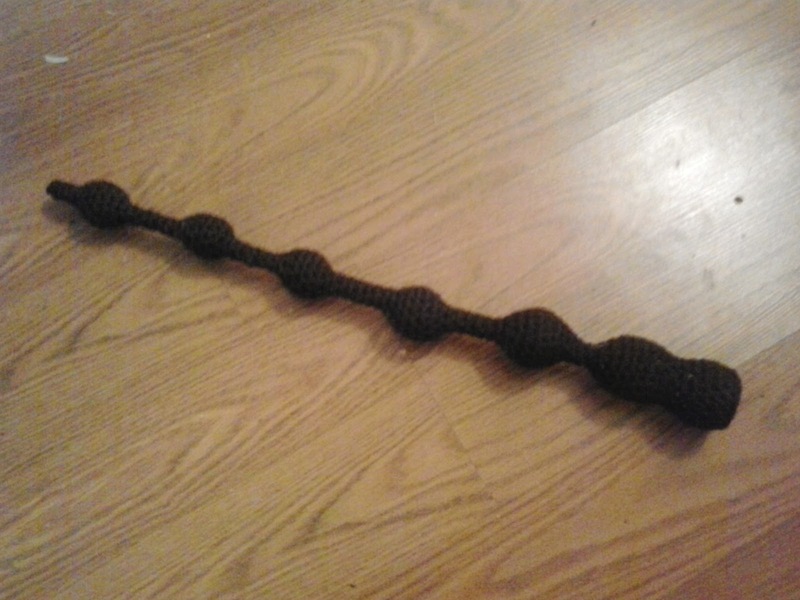 This is a pattern for the Elder Wand from the Harry Potter movies. This has been a project that I have been putting off for months now. I finally broke down and made it because we are having a Harry Potter day at work. INSERT WOODEN DOWEL. BEGIN STUFFING ELDER WAND FIRMLY AROUND WOODEN DOWEL. CONTINUE STUFFING ELDER WAND FIRMLY AROUND WOODEN DOWEL AS YOU GO ALONG. Finish off leaving a long tail. Weave tail through sc of Rd 90, pull tightly and secure. Weave in ends. Harry Potter is copyright Warner Bros. and their respective creators. This pattern is an original pattern and is © by Christjan Bee (June 2018). Please do not claim this pattern as your own. If you wish to share this pattern, you may link to this pattern but please do not reprint it on your site. You may keep a copy for your own personal use, but you may not sell or distribute it, or sell items made from this pattern.